For the second year in a row, Robby Gordon dominated the Parker 425. 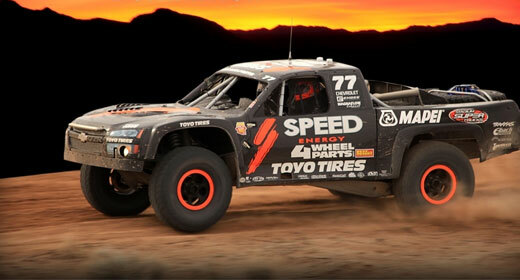 This was the first appearance of the No.77 SPEED Energy / Toyo Tires Trophy Truck since the 2012 San Felipe 250. The SPEED Energy / Toyo Tires Trophy Truck was quick from the start of qualifying on Thursday to the conclusion of the 425-mile lap race on Saturday. Gordon qualified second behind pole winner Rob MacCachren, which resulted in him starting the race one minute behind MacCachren. With an impressive start, Gordon caught and passed MacCachren within 20 minutes. Gordon talked to his crew about transmission heating issues after pushing the truck hard for the first 18 miles. MacCachren stayed within 10 seconds of Gordon for a few miles until Gordon eventually ran away from him. Gordon would then battle with Jason Voss, the fourth place starter, for the lead; Voss would stay within a few minutes of Gordon on corrected time until the second lap. At that point, Gordon’s crew made an incredible pit stop at mid-way. The SPEED Energy crew changed two tires and filled the No.77 SPEED Energy / Toyo Tires Trophy Truck with fuel in just 57 seconds. When the two drivers reached Lap 3, Gordon had pulled ahead of Voss by nearly 6 minutes and 32 seconds physically but only 4 minutes and 32 seconds on corrected time. Gordon would maintain that lead for the final lap, carefully passing slower vehicles on the course. He was the first Trophy Truck to cross the finish line, resulting in a memorable and flawless race for Gordon and navigator Charlie Holbrook. The SPEED Energy / Toyo Tires Team has made it through some of the toughest terrain in the United States and beyond without a flat in over a year of off-road competition. Gordon and Toyo Tires are extremely proud of finishing the San Felipe 250, Mint 400, Silver State 300, Baja 500, Vegas to Reno, Bluewater Desert Challenge, Baja 1000, Henderson 250, 14 Stages of the Dakar Rally and the 2013 Parker 425 all without a flat. Next up for Gordon and the SPEED Energy Racing team is the 2013 King of the Hammers event in Johnson Valley, CA on Friday, February 8. 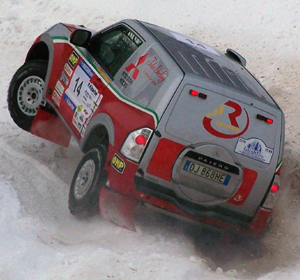 The Northern Forest Baja is back!